Kris : I am sure regular readers will recall my joy a couple of months ago when I was treated to an 8 course dinner. (Check it out HERE). 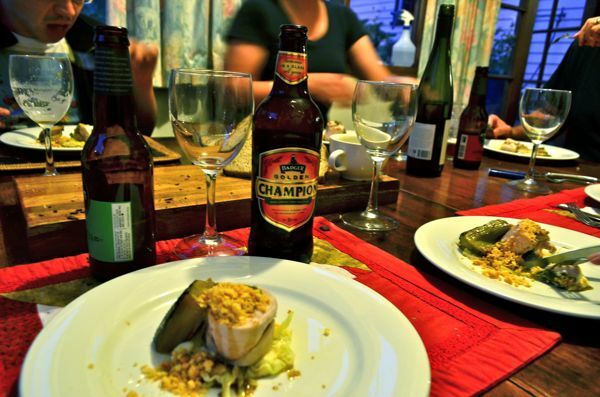 I had the opportunity to match some beer and cider to some amazing dishes created by Simon Tarbuck, a great chef visiting Tasmania from Melbourne. He was kind enough to share a couple of recipes below. 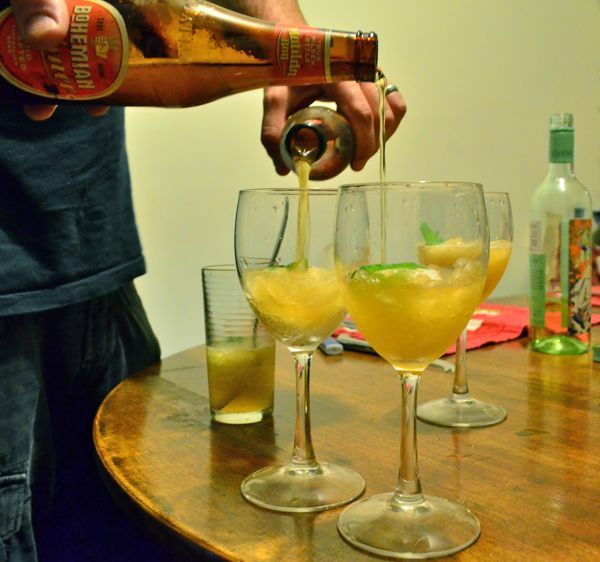 Simon : Take care not to over mix the frozen element, otherwise it reduces the fizz too much. Also, move quickly when serving. Kris: I recall Simon using Monteith’s Pilsner from New Zealand. 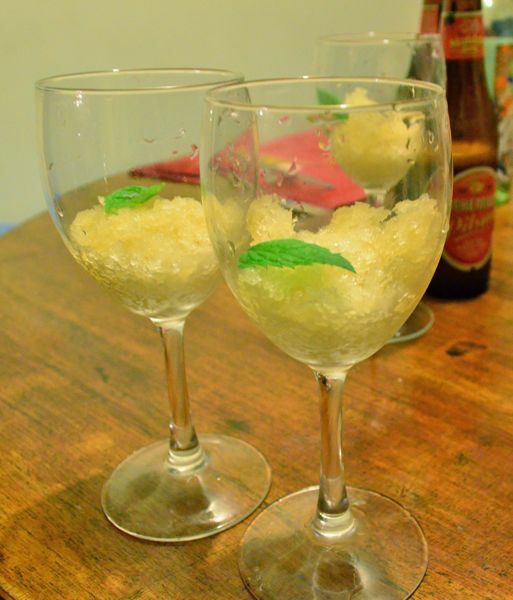 I also think Stone and Wood Pacific Ale or locally, Iron House Lager would be an ideal choice to use in the granita. 1.Switch on oven 150 degrees centigrade down a bit if it’s gas or angry. 2.In a food mixer place almonds and sugar and process till powder. Add butter and eggs, process till you have a basic, fairly loose batter. Grease a shallow baking tray, put batter in it, a thin layer is best as we are cooking to biscuit not cake throw in oven for about 40 minutes. then cool. then but back in the oven to dehydrate another 20 mins probably. 3.Whilst your crumble is developing take a (preferably heavy bottomed) frying pan, heat some oil and then burn the leeks black over as much of their surface area as possible, move them around a bit, the objective is to burn about 65 % of the exterior layer, not to burn the whole thing to dust. 4.When satisfied with the burny nature of the leek exterior, season hard with good crystalline salt, wrap in aluminium foil and sling into oven for at least an hour. Total softness is required. 5.Fry mire poix in a big pan, slowly, be patient get lots of colour, add chicken stock and myrtle leaves, simmer on the lowest possible light. 6.Take the trimmed cauliflower, put in a sieve and place in the chicken stock. they should be submerged as you are basically poaching/ blanching them. cook more than you would normally, you want the cauliflower to be soft throughout no crunch. When acceptable move to one side and allow to cool down to just above room temperature, then blitz to purée using a small amount of chicken stock from the pan to loosen if necessary. If you cooked the cauliflower enough this method will give you a consistent smooth purée. if it needs more, a hand blender attachment with a small fast blade will finish the job. put to one side. 7.Lay out two pieces of aluminium foil about 45 cm in length. lay down upon it three of the chicken thighs skin side down and spread out, but next to each other forming a consistent layer, season good. place a layer of spinach and parsley down the centre, with a squeeze of lemon juice if you fancy. Roll tightly. This can be tricky at first but if you try it a few times it will make itself obvious. I find if you gently lift the side closest to you, with your fingers pinching each end of the foil pulling away from the centre, the chicken will fold in on itself allowing you to tuck in without getting any foil in the middle of the chicken. roll it tight, twist the ends forming a sausage, use a couple more sheets of tin foil to wrap the two sausages nice and tight. at this point if you are the fastidious type you may wish to tie it with string at the ends and middle, not necessary if you have wrapped the foil tightly, but most chefs would approve. If you have time, leave the chicken sausages in the fridge for 4 hours to get used to their new proportions. when ready poach the chicken in the foil, in the chicken stock pan you prepared earlier, absolutely no boily boily, the gentlest simmer will be all that is required or the chicken will be dry. Turn the sausages over a few times, they will firm up when done, but about 40 to 50 minutes will be your target cook time. when you have removed the chicken from the stock poaching liquid, strain the veg out too, keeping the liquid. Put the liquid back on the stove and reduce till shiny and delicious. 8.Julienne the white cabbage as fine as you can. 1.Crumble your almond biscuit by hand, if there is any residual moisture chuck it back in the oven for ten on 180 degrees centigrade. Simon: Practice makes perfect when rolling things like gallantines, ballantines etc. Don’t burn your sieve handle when doing the cauliflower, or always read the whole recipe before starting. 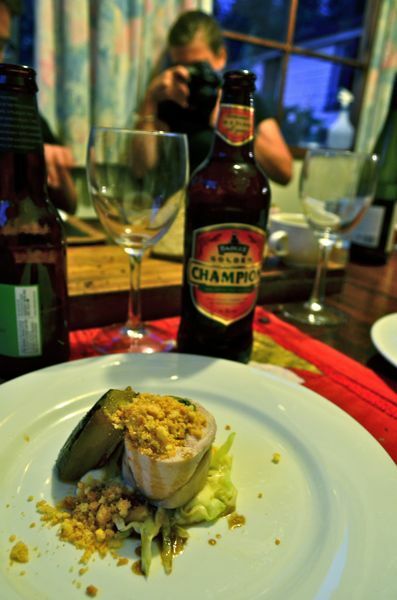 Kris : A perfect match to this dish was Badger Golden Champion (brewed by Hall and Woodhouse) from the United Kingdom. It is an English style Summer Ale brewed with elderflowers. It is slightly sweet, nutty and very floral. It was a match made in heaven, and an awesome summer beer; definitely a highlight for me.